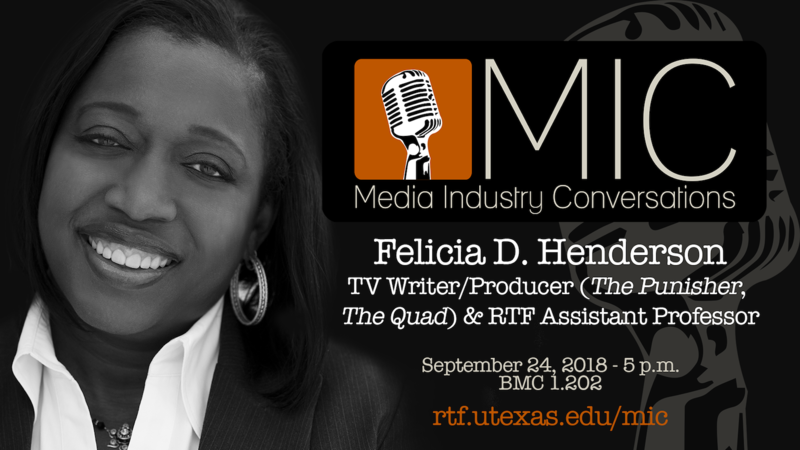 When: Monday, September 24, 2018 - 5-6:15 p.m.
Felicia D. Henderson (RTF Assistant Professor) discussed her career trajectory, her roles and responsibilities as TV writer/producer for The Quad, The Punisher, and Empire, and her views on the current state of the television industry. Felicia D. Henderson is the award-winning creator of the landmark Showtime Network hit Soul Food: The Series, television’s first long-running drama featuring African Americans. Ms. Henderson also co-created and executive produced The Quad. The one-hour series starred Tony Award winners Anika Noni Rose and Ruben Santiago-Hudson for BET Networks was named one of the “Top 15 Shows to Watch” by The New York Times in 2017. Currently, Ms. Henderson is a consulting producer on FOX’s EMPIRE as part of a multi-year development deal with 20th Century Fox Television. Under this deal, she will write, produce and direct dramas and comedies for television. Recently, Ms. Henderson also co-executive produced the first two seasons of the Netflix adaptation of Marvel’s The Punisher. The successful writer⋅director⋅producer also executive produced Single Ladies and Reed Between the Lines for BET Networks. She has written and co-executive produced such high-profile shows as Gossip Girl, Fringe, and Everybody Hates Chris. Additional credits include: Sister Sister, Moesha, and The Fresh Prince of Bel Air. After beginning her writing career in sitcoms, Ms. Henderson turned her attention to television drama writing and received three NAACP Best Drama Awards for Soul Food; a Gracie Allen Award for her depiction of women; and a Prism Award for Accurate Depictions of Social Issues. She garnered a Writers Guild of America nomination for Fringe. Ms. Henderson is also an assistant professor at the University of Texas-Austin in the Department of Radio-Television-Film. Having earned B.A. and M.F.A. degrees from UCLA, Ms. Henderson was honored with UCLA’s Tom Bradley Alumnus of the Year Award in 2014 and the UCLA School of Theater, Film and Television’s Alumni Achievement Award in 2010. She also received an M.B.A. from the University of Georgia, where she was an NBC/Peabody fellow. Continually in pursuit of knowledge, Ms. Henderson is a Ph.D. candidate in Cinema and Media Studies at UCLA. Her research interests include: culture, class, race, and gender issues in television writers’ rooms; political economics of the 2007 WGA strike; and the “othering” of single women in the media. She has written chapters for two text books and her critical essays have been published in some of the most prestigious academic journals in her field. Ms. Henderson is a trustee for the Humanitas Prize (an award for film and television writing intended to promote human dignity, meaning, and freedom) and mentor for the Humanitas Prize New Voices program. She is a Diamond Life Member of Delta Sigma Theta Sorority, Inc. (a public service sorority); a board member of Dancing N.E.D. (a non-profit that raises funds for the treatment of women’s cancers); and an honorary board member of Los Angeles-based Coalition for Restoring At-Risk Youth (a non-profit that provides social, mental and medical care to at-risk and homeless youth). Ms. Henderson was born and raised in Pasadena, CA. She and her four-legged human, Muffin, split their time between Los Angeles, CA and Austin, TX.